Southern Pines, NC (PRWEB) November 7, 2007 â€“ Bea Fields joins a distinguished group of executive coaches to present the new book, Millennial Leaders: Success Stories from Todayâ€™s Most Brilliant Generation Y Leaders (http://MillennialLeaders.com). This volume, co-authored with fellow executive coaches Scott K. Wilder, Jim Bunch, and Rob Newbold, is packed with insight and promises to be the go-to text for people looking for a glimpse into the mindset of the emerging group of business leaders from so-called Generation Y â€” those between ages 18 and 30. Natural entrepreneurs with adventurous spirits, members of Generation Y are just now making an impact in business and in the culture at large. In addition, as the first group to grow up immersed in media culture, they have a distinctive way of ordering their lives. And Millennial Leaders brings readers a unique, close up look at the people responsible for the cutting edge of social and business trends. The authors offer 25 interviews with the Gen Y members. Millennial Leaders genius is that it acts as a kind of double guide. For older generations who need to unlock the code of how to communicate with Generation Y, the book provides substantial insight into their psychology. 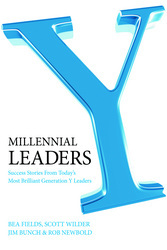 As well, Millennial Leaders provides Gen Y with over 100 successful, concrete strategies for personal and career success. The book inspires older generations who want and need to be receptive to members of Gen Y while at the same time helping Gen Y members chart a sure course to achievement. The result is a book that merges the authorâ€™s own unique skills with the special insights proper to this up and coming generation. â€œThey are our future, and it is time to start working with them â€” not resisting their efforts,â€ said Fields.